Converted from a century-old office building, and built on the spot where the final incursion on the Alamo began, Hotel Indigo San Antonio at the Alamo holds far more history than its unassuming façade lets on. Within easy walking distance of the Alamo’s still standing remains, as well as plenty of San Antonio’s other museums and attractions, and home to its own alleged family of spirits, this is a perfect spot for visiting history enthusiasts and ghost hunters to hang their hats. This early 20th century high-rise in Downtown San Antonio, once an ultra-modern marvel, is now easily overshadowed by its taller, more publicized neighbors. The relatively young hotel operating out of the 110-year-old structure quietly cares for its guests with comfortable rooms, complimentary breakfast tacos, and a bar that celebrates happy hour all day, every day, seeming to withdraw itself from the local competition to be the most aggressively special hospitality provider in town. Nothing about the Hotel Indigo’s subtly dated exterior or cheerfully welcoming décor hints at the bloody horrors the ground beneath it has witnessed. Yet many believe the past can never be quieted. Not to be confused with the Hotel Indigo-Riverwalk half a mile north, the Hotel Indigo San Antonio at the Alamo, sometimes known as the Gibbs Hotel, is as close as you can get to rooming inside of San Antonio’s legendary last stand, without getting yourself locked in overnight at the museum across the street. While many of the historic hotels in San Antonio advertise their convenient closeness to the Alamo and the possible presence of soldiers’ restless spirits, the Hotel Indigo has the distinction of being built on ground where part of the Alamo once stood, before the fort was scaled back to the museum that exists today. The Indigo’s footprint wasn’t just any part of that once-sprawling fort either; it was the northwest corner, where the final assault began and Santa Anna’s troops breached the perimeter. Some of the most brutal moments of this fabled battle took place right where the Indigo now stands. Just before dawn on March 5th, 1836, after a twelve-day siege on a fortification only supplied to last four, about 2,000 Mexican troops approached from the northwest, killing three slumbering sentinels before they could raise an alarm. When they started their chant and bugle fanfare, they were already within range to fire their muskets at the waking Texan soldiers who rushed to the battlements. Within fifteen minutes, Mexican General Juan Amador had scaled the wall, spurring on his troops to follow him and open one of the northern gates from the inside, and the rest is history. More than seventy years after the outer walls of the Alamo came down and the fighting ended, the current building was erected in 1909. Upon its unveiling, the Gibbs Building, as it was then known, was the first office skyscraper in San Antonio. Management of the Gibbs Building was always very proud of its beautiful elevators, all the way from when they were an innovative modern convenience to when they had become a strikingly well-preserved historical curiosity. The Gibbs was the last building in San Antonio to employ elevator operators, keeping its original antique elevators running until its closure as an office building and reopening as the Hotel Indigo in 2006. During the construction of the Gibbs Building, two of the original cannons that once stood on the Alamo fortifications were found in the basement of the demolished Maverick Homestead, which had stood on the spot during much of the intervening time. Both cannons have now been relocated, one to the preserved remains of the Alamo across the street, the other to the Briscoe Western Art Museum some blocks south, but their removal from their first resting place marks the beginning of the unexplained phenomena on the property. Shortly after the cannons had been placed in their new homes, a security guard at the next door post office saw two indistinct figures pushing a cannon across the street in the pre-dawn hours. He first assumed they were preparing for a reenactment, but after checking, he discovered there were no reenactments planned, and no one could account for a cannon being moved that morning. This might be the first ghost sighting connected with the Hotel Indigo, but it would be far from the last. It’s no wonder that those first fifteen minutes of the incursion at the Alamo’s northwest corner may have left a mark on the ground that bulldozers and backhoes can’t remove. Troops on both sides of the conflict were in bad shape and suffered massive, rapid casualties during those minutes. The majority of the Mexican soldiers had been forcibly conscripted and were deliberately hemmed in by cavalry from their own side who had orders to shoot anyone attempting to retreat. They were freezing and forbidden to wear coats in order to keep them as mobile as possible, and their confined formation and lack of training combined to cause heavy friendly-fire casualties, as the soldiers in back tried to shoot their inaccurate muskets over the heads of those in front. For the Texans’ part, they were starving, exhausted, low on ammunition, and stuffing their cannons with horseshoes, nails, door hinges, and anything else they could find. Most of them were volunteers, also with little training, and did not know about President Santa Anna of Mexico’s orders to execute prisoners of war on the spot. They were tasked with defending an ungainly and already crumbling “fort” that was originally built as a Spanish mission and never intended to stand up against an enemy armed with anything heavier than bows and arrows. Texan solders had to lean all the way over the wall to shoot, exposing their upper bodies as easy targets. By the end of that first fifteen minutes, the northwest corner was piled with bodies, on and outside the wall, and the soil was soaked through and marshy with blood. From the early days of the Gibbs Building, occupants have reported hearing the sounds of cannon fire and screams, and seeing soldiers running about in terror, forever stuck in the horror of this battle. The Hotel Indigo’s most famous apparition, William B. Travis, was a failed newspaper editor and lawyer who had run to Texas to avoid being arrested for his mounting debts, leaving his pregnant wife and young son with nothing but a promise that he would return or send for them when he had found a way to support them. In his early efforts to make a name for himself in Alabama’s high society and create the kind of lifestyle he imagined his family should have, he had bought two slaves to assist his wife, but ended up taking one with him when he fled. That slave, known only as Joe, ended up being personally spared by Santa Anna after the battle of the Alamo, in an attempt to win other Texan slaves to Mexico’s side. Travis himself rose to the rank of Lt. Colonel in the Texan army and originally protested his orders to lead reinforcements to the Alamo, believing it to be a doomed assignment. Shortly after he arrived, he was put in charge when the commander left to gather further support. The soldiers distrusted Travis, rejecting him and electing their own leader, James Bowie, who promptly went on an out-of-control celebratory bender, after which he and Travis apparently came to some kind of accord and declared themselves co-commanders of the Alamo. In this, at least, Travis kept his word. Whether he had found purpose in his doomed assignment, or was simply terrified of living with another failure, he was one of the first to the battlements, shouting encouragement to his men as he went. He was also one of the first to be shot when the Mexican soldiers made it over the wall, and reportedly continued cutting through them with his sword while he bled out. The cattle baron Samuel Maverick, he who gave the name “Maverick” its current connotation of “independent-minded,” was summoned away from the Alamo just four days before it fell, to act as a delegate at the convention on Texan independence. After learning of the slaughter, he felt such a strong draw back to the place where it had happened that he built his home there — the same homestead that was eventually demolished to make way for the Gibbs Building. 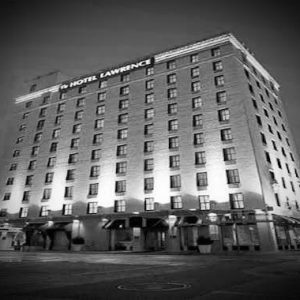 Many believe that his spiritual tie to this spot continued after his death, and that he still wanders the halls of what’s now the Hotel Indigo, in search of his fallen friends. Some believe that one haunting paves the way for more, which would explain why even the peaceful days of the Gibbs office building seem to have left a strong impression behind them. Though the famous original elevators are no longer in operation, they’re still there, and the front desk staff have had to calm more than one guest who could swear they’d just seen a lady in a ‘40s vintage suit boarding or disembarking. Some have even seen glimpses of one of the elevator operators in his blue uniform and white gloves. Whether or not you’re lucky enough to glimpse any of the Indigo’s permanent residents, if you’re looking for a vacation spot that’s close to the action, both past and present, it’d be hard to do better than this often overlooked hideaway.